Here is my first real entry in honor of the upcoming holiday. A new tradition in my family is to make a homemade ice cream cake for our Fourth of July celebration. Here is a link to a great recipe I found in a Family Circle mag a couple of years ago. Luckily they have the recipe online at there website. It is absolutely delish! 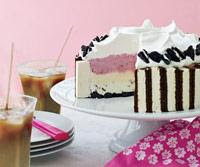 Who doesn't love ice cream cake???? 1. First, I omit the Oreos on top and replace them with fresh raspberries, blueberries, and/or strawberries. I also add some little flag pics and you have a dessert worthy of any Independence Day celebration. 2. Make sure your pan is very cold. Actually put it in the freezer for a few minutes before starting. 4. You may also need to put the pan in the freezer every few minutes to keep everything nice and frozen, especially on a warm day. If it gets melty, you won't have nice neat stripes from the ice cream sandwich cookies. 5. Last tip: You can switch up the ice cream flavors to your liking and add hot fudge and/or crunchies to the center layer to make it even more fabulous! Let me know what you think. And remember this is my first attempt at this blogging thing, so I hope there aren't too many errors! This is gorgeous and I am so excited for your new blogging adventure! You are such a resource and I look forward to seeing your ideas come to life!